Pokemon! We heard from some moms whose boys are obsessed with Pokemon so we decided to do a Pokemon books list. We will likely get to the reading books and graphic novels as well but let’s start with this. 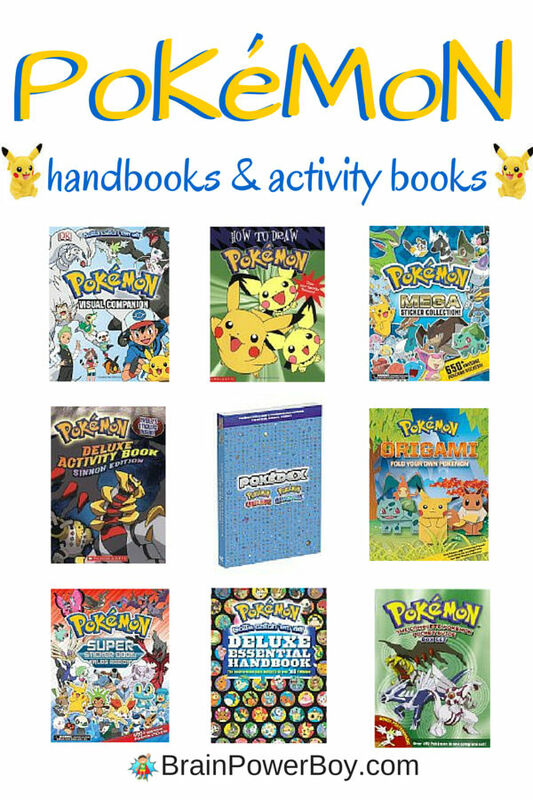 If you have a boy who is all about Pokemon, grab a few of these handbooks, activity, drawing, orgami and sticker books and you will have a happy guy! Just think about all the things they will be learning by messing around with these Pokemon books. Reading, art, math skills, memorization, analytical, hierarchal reasoning, and narrative skills. When you are really into a topic, handbooks are an awesome resource. I have seen boys who “don’t like to read” spend hours looking at this type of book. Deluxe Essential Handbook Well, if it is deluxe and essential you know it has to be good. It actually is! This handbook has been revised and updated and has a lot of great reviews on Amazon. It includes stats and facts on over 700 Pokemon. The Complete Pokemon Pocket Guide Box Set includes both vol. 1 and vol. 2. Each book includes one Pokémon per page with descriptions and stats which include the character’s abilities, moves and evolution. Pokemon Visual Companion is a reference to key characters, famous battles, and important places of the Pokemon animated series. How to Draw Pokemon 32 pages of step-by-step drawing instruction. I like that it makes the characters easy to draw with illustrated directions. Pokemon How-to-Draw Kit: Starting with All-Stars! Draw 15 different characters. This is nice because everything is included: 32-page book, practice pad, some sticker sheets to draw on, Pokemon pencil with sharpener, 4 crayons, 2 custom molded erasers, and a pencil pouch. These are super cute! Pokemon Origami: Fold Your Own Pokemon! There are 48 pages of instructions, full color pictures and special origami paper to make 10 projects. Wow, when they say mega they mean mega! Pokemon Mega Sticker Collection Includes over 650 stickers plus info about favorite Pokemon characters. Pokemon Super Sticker Book: Kalos Region This book also has a lot of stickers – over 400. There are also a few oversized stickers. Pokemon: Deluxe Activity Book: Sinnoh Editon Puzzles, mazes, quizzes, and more. Here are a few neat Pokemon selections to check out as well. Click image to learn more. To end this fun list of Pokemon books check out these positive quotes from characters in Pokemon. Have you seen any with a lock? Like a journal with activities or just blank pages? Or anything similar? I took a look around at several places but I cannot find anything with a lock. Sorry!